Watch Size Systems The size of the movement is measured as the narrowest distance across the dial plate. On a typical round pocketwatch, this is just the distance straight across to lower plate, through the center. Measuring the dial itself will come pretty close on most watches, but that distance will often be a bit less. Importantly, this measurement is the dial side of the movement, not the size of the watch case. A "lignes", pronounced like "lines", is 1/12th of an old style French inch, which is a bit larger than an English inch. One lignes is 2.25583mm. Swiss watches are often seen described by their size in lignes. The size of vintage European, and modern watches is typically stated in lignes. 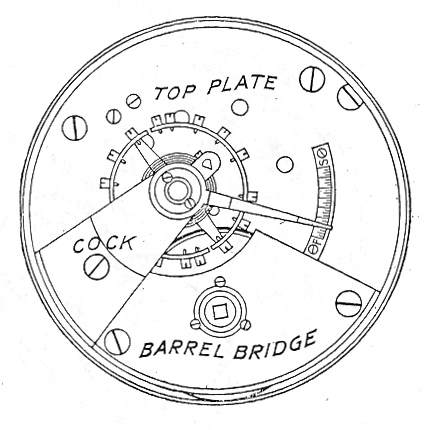 The Lancashire Gauge for determining watch sizes is different and is of English origin, although its exact roots are not known. In this system, 1 5/30th of an inch is taken to be a base figure of zero. This system of watch sizes, sizes like 18, 12 and 16, is typically used in describing vintage American pocketwatches. Watch movements smaller than 1 5/30s inch (zero size) are written with "/0" or "-1" appended. For example, the next size smaller than size 0 listed in the table below is "2/0". The measurements in this table are commonly referred to pocketwatch movement sizes from large to small.